Feeding yourself or a family can cost a lot of money every month. However, a bit of planning coupled with some sensible choices is an easy way to reduce your grocery bills and save more. Before you hit the supermarket – It is best to start your weekly shopping with a shopping list. Paying with a credit or debit card is a good way to track how much you spend on groceries for a week instead of paying in cash. 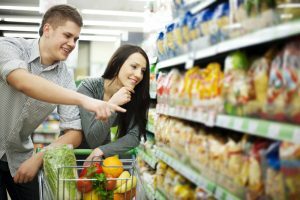 When visiting the supermarket, it is best to leave your kids at home or take them with your partner as this would mean that you can concentrate on reading labels, prices and look for discounted items. Plan your meals – Start off by determining how many meals you will need for a week and then look for recipes that your family will love. Remember to focus on locally available ingredients as they will be cheaper and freely available at most supermarkets. Bulk cook and freeze – Making extra portions will mean that you can freeze meals that can be used later on during the week. Having food in your freezer will also mean that you don’t have to opt for take-out, as you can always put together a meal on short notice. Ditch expensive takeaways – If you buy a lot of takeaways, consider other options that are budget friendly as well as better for your health. Look at recipes that mimic takeaway foods you regularly buy or opt for healthy frozen foods like stir-frys and pizza from the freezer section of your supermarket.